If you’re looking for a Farm wedding venue, whether it’s a Barn or Festival wedding you want to organise, we’d love to help. Our site here at Somerset Yurts provides the opportunity for you to create a beautiful rustic DIY wedding reception with plenty of freedom to make the event unique to you. Here at Somerset Yurts we have a Yurt (and Dome and Safari tent) glamping site spread over about 3 acres as a part of our Dairy Farm, with a wonderful old “Dutch Barn” or “marquee” site that you can use to host your wedding reception. There’s plenty of space for entertainment, parking, and glamping – and we can help you with contacts for catering, services, and other suppliers. The Yurts and Barn provide a pretty unique site for your wedding reception. It’s a great, hidden away, location for a nice relaxed celebration of your marriage. The Barn could be the perfect venue for you but, we also have a large flat “marquee” (for want of a better name) site in one of the Yurt fields – so if don’t want to use the Barn, there’s space for you to hire in a large party tent to host your guests more of a festival wedding setting. We’re flexible and want to help you create the perfect event for you to celebrate with your friends and family. 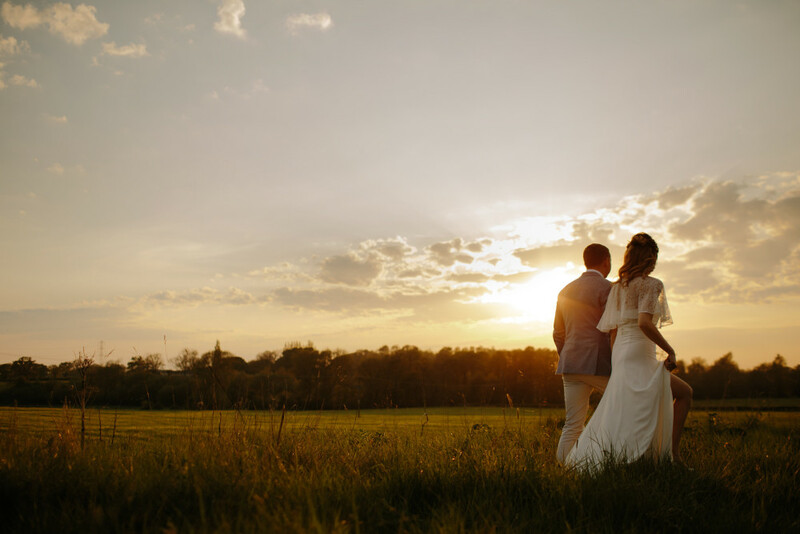 We’re not licensed for the formal ceremony, so you’ll need to do the legal marriage part elsewhere, if you need suggestions for that please get in touch – but we can help you host your evening celebration the way you want it in the beautiful Somerset countryside. The Dutch barn is a really traditional farm building, seen on many farms up and down the UK, you’ve probably driven past loads of them on your travels. It was traditionally used to store hay, straw or silage as feed for cattle over the winter. Our Dutch Barn is still used for straw storage over the winter, but during the nicer months of the year it’s empty and useable to host parties. 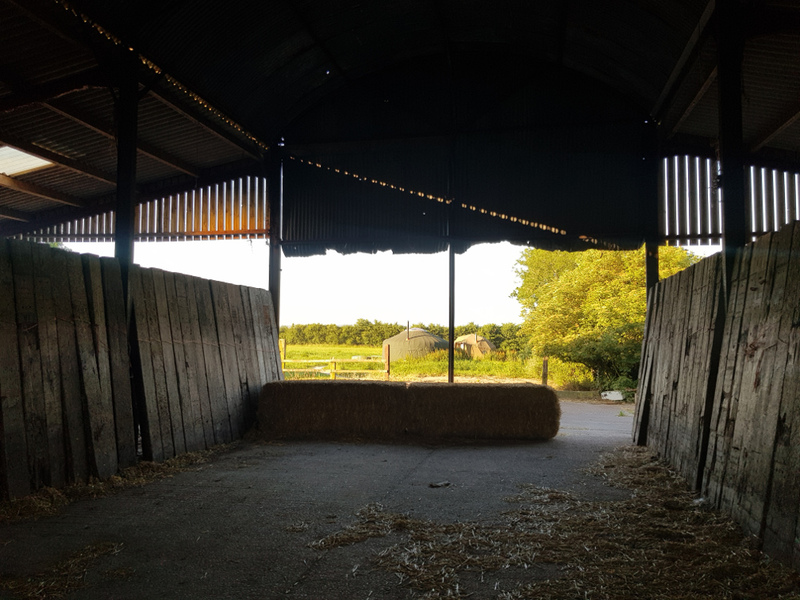 In those nicer months, we stack straw bales to act as temporary walls at either end to “keep the weather out” – creating a great event space, which you can decorate as you wish. We can also provide small bales with blankets for seating for a really simple rustic look. The Barn has good electric and water supplies for all your entertainment and catering requirements. The middle section of the barn is about 60ft * 30ft, and the “lean-to” is about 60ft * 35ft – all of which is available for you to use, and provides a fairly huge undercover area for entertainment or seated catering. 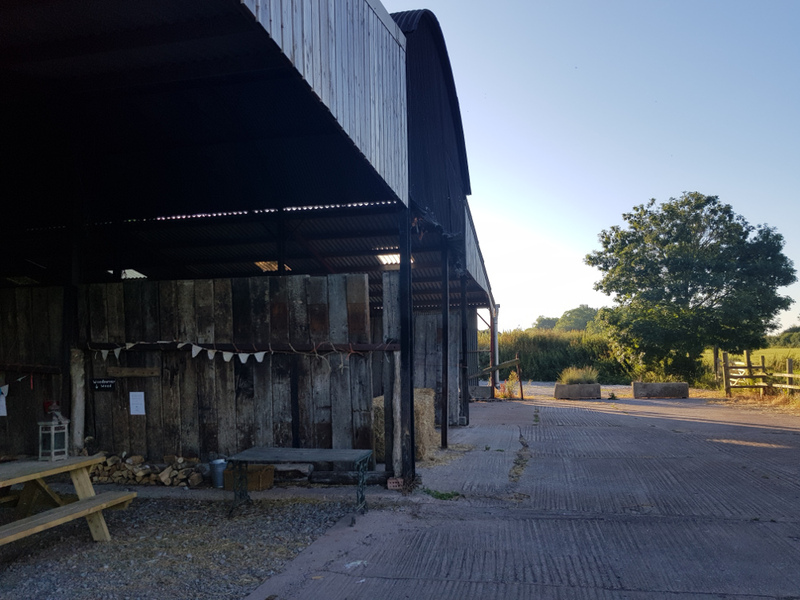 There’s also a large “yard” area at the back of the barn, perfect for hosting catering vans, and posh loos for your guests. If you’re looking for ideas about Barn Weddings, boho-weddings.com has a section with lots of real barn weddings. 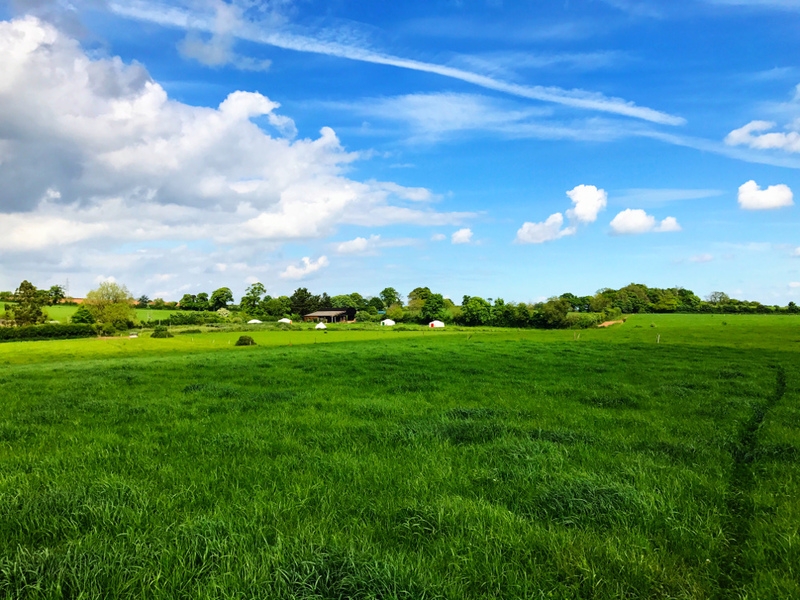 To give lots of options for wedding receptions, we also created a 30m * 30m nice flat site (with water supply and electric) so if you’d prefer to hire in a Marquee/Stretch Tent/Large Yurt/Tipi for your wedding reception – the option is there for you as well. Of course, we’re biased, but we think we’re a great option for a festival wedding – whether you use the barn or the field around it – the flexibility is there for you to choose. If you want to go for the tented field wedding option, there are some great suppliers of stretch tents, HUGE yurts, and marquees that we’ve been in contact with and would be happy to help provide for your reception. Yurts for life – https://www.yurtsforlife.com/yurts-for-weddings/ We bought one of our Yurts from Sasha at Yurts for Life – she’s really helpful and diligent, and we’re sure she’d love to help you. https://southwestmarquees.co.uk/wedding-marquee/ is one company that we spoke with when we were creating our marquee site – they were very helpful to us at that time. 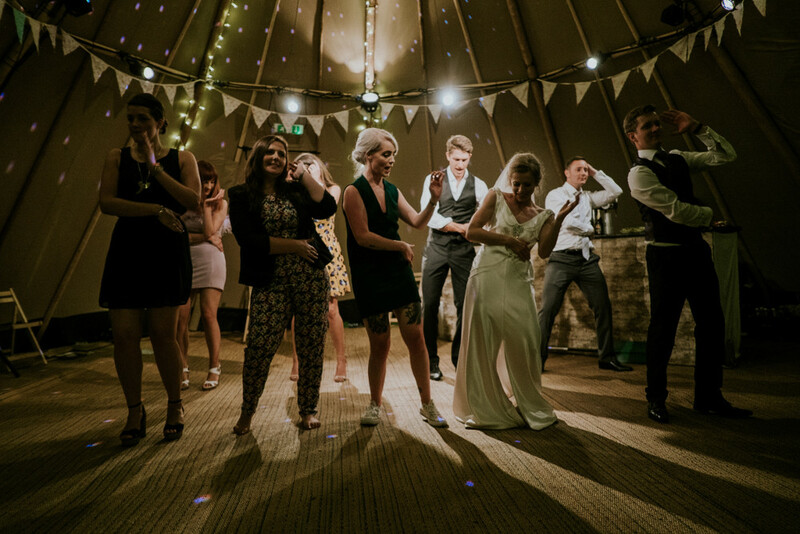 Obviously, there are loads more options for large tent hire – http://thenaturalweddingcompany.co.uk/directory/wedding-tipis-tents-yurts/ provide listings of loads of options! We also have a pinterest board capturing some great ideas that we think could look great on our site. Creating your own event is a great option if you’re wanting to do something a bit different than the traditional hotel package “white” table type of wedding reception. We think the Yurts and Barn make a great venue where you can really create a unique event to celebrate with your friends and family. 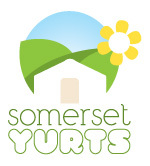 An added benefit hosting your reception here at Somerset Yurts can be done in quite a budget friendly way. We’re a small site here so you’ll be booking all our accommodation of 8 glamping units – plus a charge for using the site for your wedding. Total costs for the site for a weekend is in the region of £4600 depending on the time of year. Please see our wedding price list page for more details. Over half of that cost is for accommodation, so if your guests are paying for their own accommodation, the cost to you as bride and groom is significantly less. For the evening the site can host up to 120 guests – and we can sleep around 30 across our glamping accommodation, with extra space for campers too – contact us for more details. This list isn’t meant to be exhaustive, but to just give some idea of potential additional costs. You’ll quite probably want some music to dance the night away, so you can happily organise a band or DJ. The options are too huge to list here! We’ll need to chat about your plans so we can organise the required “Temporary Event Notice” for you with our local council. One of the benefits of staying with us over the weekend, is that you get to extend time with friends and family – not just the day itself, which can be a bit of a whirlwind! The day before, you can all arrive at your leisure in the afternoon, and share a family BBQ, whilst getting everything ready for the big day ahead – preparing the flower jars, bunting, seating etc. On the morning, preparations can continue after a champagne breakfast 🙂 Relax and take a stroll in the fields, then everyone can get dressed up for the ceremony. 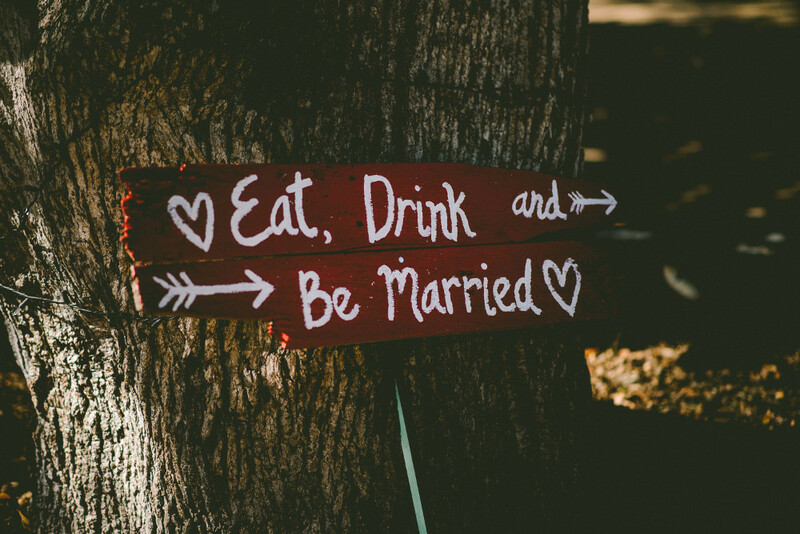 Once the ceremony is over, the party and celebrations can begin back at the yurts and barn! A lovely idea for the afternoon is to have a folk band play some barn dance style tunes to get everyone in the mood while you nibble on your picnic hamper/pizza/hog roast (see below for more yummy food inspiration!). Later on, a covers band to get everyone up and dancing, or a DJ playing some of your favourite tunes will really get the party started! Other things you can have going on include – campfire and marshmallow toasting, bouncy castle, ice cream cart, sweet treats cart, photo booth… we are sure you have some ideas of your own too! Hog roast – https://www.pynethebutcher.co.uk/hog-roast.htm Pynes are a great local butcher to us – we shop there fairly regularly there as a family so can vouch for the good quality products sold. That’s just to give you some “food for thought”, haha 🙂 again there are loads more options out there, and I’m sure we’ve missed plenty of good ones. Of course, you can do a DIY bar, or your guests can bring their own to share – there are also lots of options available for mobile bar hire for your event. As an example, there are several companies listed on this site: https://www.poptop.uk.com/taunton/suppliers/catering/mobilebar/ and we can help your search if needed. We’re a small glamping site most of the year, with perhaps 20-30 people on site maximum. As such, hiring in portable toilets for your guests is required if you do decide to book your wedding reception here. There’s a field over the road from the Yurt site that we use for your guests parking – hopefully keeping non essential vehicles away from the site so they don’t appear in the background of any photos, and don’t present any danger to children on site. We have a few standard wedding signs that you can use at the various road junctions on the way to our site to help your guests find us. Being a working Dairy farm there’s lots of options for some rustic wedding photos – from old farm implements, to the full dairy herd, to lovely old Oak trees, to some far reaching views over the vale of Taunton to the Blackdown hills- just have a chat with us, and we can help your photographer work out some shots. A fun idea could be hiring in a photo booth for your guests to capture some memories of the night https://boothparty.co.uk/ provide photo booth hire locally and may be able to help you. The site is yours for the weekend (or midweek) so you can really make the site and your event as unique as your imagination. Sleeping on site a total of about 32 (or 8 families of 4). We’re also open to additional guests camping so please call to discuss your requirements. The facilities for people staying in our accommodation include a section of the barn with a regular kitchen, and proper flushing loos and power showers. 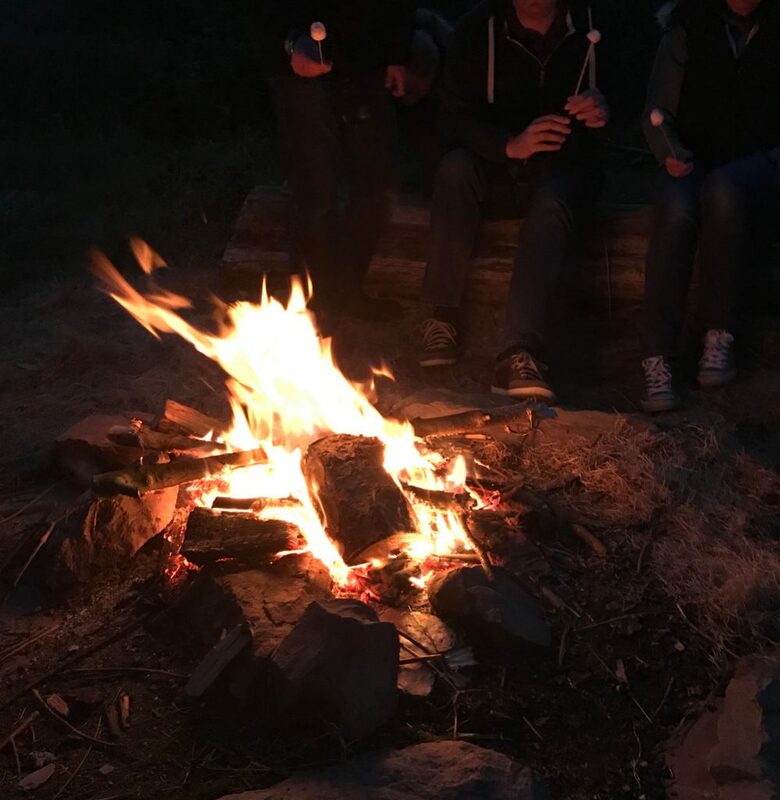 There’s plenty of BBQ’s and fire areas so you can enjoy a nice campfire with your closer family / friends on the night before or after. More details are available on our Yurts and Facilities pages.